Nymuls is a group of bitumen emulsions designed for a wide range of road construction and maintenance purposes including specialist emulsion for cold mix applications. The RX category of Nymuls provides superior performance when used with reclaimed asphalt. To make good a 3.4km stretch of the motorway's eastbound carriageway which had been built with an experimental 200mm thick base course of fly ash stabilised gravel. Over time, the base course had developed considerable strength, turning from a flexible into a semi rigid pavement. Twenty five years on, the bitumen bound layers above the base course displayed extensive reflected cracking. The base course was left in situ, it was capped first with a 120mm thick unbound layer of crushed stone to form an anti-cracking and levelling medium, and then a new 200mm basecourse of cold recycled asphalt was installed, employing the superior quality bitumen emulsion Nymuls RX. A 40mm stone mastic asphalt surface course completed the refurbishment. The A1 is Lithuania's main cross country route, linking Vilnius – the capital in the east – westwards to Kaunas and then Klaipeda by the Baltic sea. Maximum traffic density along the 300km long, dual four lane highway is 40,000 vehicles per day. It is towards Klaipeda that a 3.4km stretch of the motorway's eastbound carriageway was giving trouble. This stretch of the road had been built in the mid 1980s with an experimental 200mm thick base course of fly ash stabilised gravel. Twenty five years on, the bitumen bound layers above the base course suffered reflected cracking. The LRA had two problems in reinstating the carriageway: what to do with the base course and how to rebuild the pavement in the best way. Removal of the base course was not really an option. The LRA is committed to reusing all road building materials but there is no experience of recycling flyash stabilised gravel. 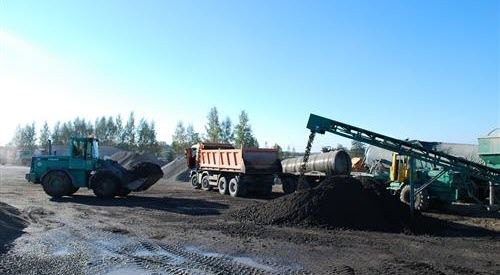 Roads civil engineering contractor responsible for the A1 recycling was Zemaitijos Keliai which has invested substantially in cold mix technology. It has a licence from Nynas to produce Nymuls RX, the premier bitumen emulsion binder used in cold mix. The A1 section under repair first had its three existing asphalt layers milled off and the planings graded and stockpiled at a temporary mixing plant. Crushed stone was placed on the original base course. Then production of the cold mix for the new base course began, using the reclaimed asphalt, some virgin aggregate, fillers and the Nymuls RX bitumen emulsion. This material was placed in two layers each of 100mm after which an 80mm thick hot asphalt concrete binder course was added. This was followed by the 40mm stone mastic asphalt surface course. The cost saving of the recycled solution was around 20%. Download this information on how Nybit RX was used at A1 Motorway, Lithuania, as pdf.